When winter rolls around and everybody starts getting sick, people swap cold remedies like trading cards, trying to find the one overlooked method that will actually get the job done. My mother always told me to eat lots of soup and drink lots of water. As a grownup, I’ve modified her advice slightly: Eat lots of spicy instant ramen and then you’ll definitely drink lots of water—two birds, one stone. You’ll also have clear sinuses immediately. In America, most of us hear “instant ramen” and picture Nissin Cup Noodles, the textbook definition of non-perishable food in the form of a flour-and-salt brick, found in nearly every freshman dorm room. But instant ramen has grown into a surprisingly sophisticated market in the last few decades, especially when you dig into the spicy variants that exist. They’re flavorful, quick to make, and hot as hell. With differing sauce packets, a range of dried vegetables, all sorts of oils, plus the advancement of noodle-manufacturing technology, a number of instant ramens could give sit-down restaurants a run for its money. So in the midst of a notably cold winter, I decided to finally determine which spicy instant ramens are as hot as they claim to be. Unlike our resident Ramen Lord Mike Satinover, who handles all things ramen with a chef-like mindset, I’m approaching this purely as a Scoville aficionado. In other words, instead of ranking these based on flavors and quality of ingredients, I’m basing strictly on heat. To narrow the list down to 13, I bought 18 different types of spicy instant ramen. The variants chosen came from different Asian countries—South Korea, China, Malaysia, Japan, Indonesia, and Singapore were represented here. Most importantly, all of the instant ramen had to be easily accessible, either coming from H Mart or Amazon. 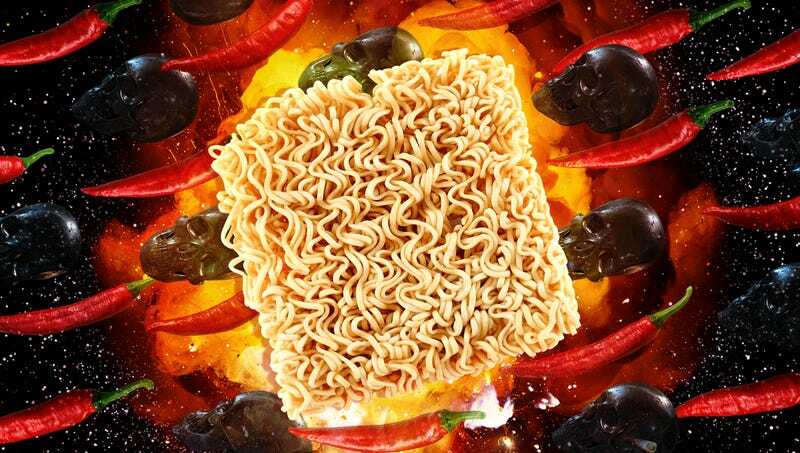 There are several well-known spicy instant ramens that couldn’t be on the list—though, to be fair, those of you under 18 years old couldn’t try some anyway. Things got spicy as expected, though none of the meals came close to the heat of a ghost pepper or Carolina reaper. That just means the spicy instant ramen game has plenty of room to step up. It also means anyone who enjoys the thrill of a good kick mid-meal will definitely find a new favorite below. It’s tempting to believe the Polaroid-looking artwork on this was chosen as a tip-off. Just like the vintage camera, Indomie’s Mi Goreng Hot & Spicy ramen requires more steps than usual to make an otherwise surprisingly worthwhile product. With a whopping five packets (seasoning powder, chili powder, soy sauce, seasoning oil, and chopped fried onions), this one creates a thick paste of a sauce that quickly thins out when the noodles are poured over it. What starts out as an onion-forward meal soon unfolds into a warm chili aftertaste. Honestly, it’s a pretty complex flavor for being the smallest package of the bunch, and one that’s enjoyable from start to finish. Companies, say it with me: When you list descriptors, the least-applicable one comes last. After reading a handful of glowing reviews, I was eager to finally try Sichuan Baijia Chongqing Original Hot And Sour. The flat, loose texture of the noodles are a welcome change-up from the traditionally round, curled shape of ramen noodles. While the heat is there, courtesy of a Sichuan pepper blend, it clings to the noodles like a thin paste. You get the feeling you’re eating a curry-like pasta dish, one that begins to sacrifice spice in flavor of tang. It was an oddly acrid, overly sticky ordeal that left me questioning the veracity of the smizing Chinese cartoons on the package. Maybe sour noodles just bring them joy? If you want a comfortably spicy heat without ditching the traditional flavor of miso ramen, Ohsung’s Hot & Spicy Hong Ramyun Noodle Soup is the packet you’re looking for. An orange broth this clear should get that message across right away. The capsicum powder offers plenty of heat but not much flavor, mainly because the salt and MSG overpowers everything already. There’s a reason this one is 95 percent of your daily sodium intake. Even when you reach the bottom of the bowl, there’s no extra flavor hiding in the pooled remnants of broth. It’s like adding a few shakes of crushed red pepper to your meal: a bit of kick to accentuate what’s already there, but nothing looking to steal the show. I never thought an instant ramen would bring to mind the words “delicate” or “clean,” but then I tried Paldo Kokomen. With an emphasis on green onions, chicken, and red pepper powder, this broth is thin and vibrant, as if you actually cooked it from fresh produce. Jalapenos aren’t listed as an ingredient, but it tastes like a single pepper was diced and dissolved into the broth. It’s a smooth, light heat that remains constant throughout. This is one of the few, if only, spicy instant ramens you could eat in the summer and still feel refreshed upon finishing it. To quote the late food magazine Lucky Peach, “There’s just nothing like this on the market right now.” Maybe that’s for the best. MyKuali’s Penang White Curry Noodle is a thick, flavorful, heavy dish that’s more like a kitchen-style curry than a packaged ramen soup. While this dark brown dish packs a decent amount of heat (think a distilled chili paste), it eventually loses its appeal. The broth begins to clump, yielding a grainy texture that’s most comparable to someone sprinkling a handful of sand on their dish. Is it the top instant ramen in the world like Lucky Peach says it is? That’s debatable given it was the only ramen out of all 18 that I struggled to finish because of its texture. And yet despite this, its heat earns it this spot, if only because it opts for a more complex layering of chili, shrimp, and garlic notes. Not all veggies are created equally. Most of the dried vegetable packets that accompany instant ramen contain fish food-style flakes of vegetables. Ottogi Yeul Ramen Hot Pepper Flavor takes the usual assortment of veggies—green onion, carrot, mushroom, cabbage, all of which were notably sized—and uses them as vessels to carry the spice beyond the broth. You can feel the heat right away: a cayenne-like flavor nestled in a broth reminiscent of sweet tomato sauce. Thanks to the amount of vegetables included, you get to taste that spice when eating the noodles and sipping up the broth. Instant ramen can pack surprising depth, and JML Instant Noodle Artificial Spicy Hot Beef Flavor is proof. Expect the flavors (and heat) to come in waves. It starts off true to name, with the beef bone soup hitting your taste buds first, followed by the saltiness ramen is known for. Then comes the heat: a blend of chili peppers, crushed peppercorns, and a hints of ginger and garlic. With both a powdered sauce and paste sauce contributing to the broth, this JML ramen has a subtle density to its flavor—which gives the spice time to sneak up on you, especially when it starts to sting your lips. Pay attention to the water instructions when it comes to instant ramen. The biggest giveaway of a spicy ramen that’s actually spicy is how much water you have left, if any, after boiling the noodles. Paldo’s Bulnak Bokkummyun Spicy Fried Octopus Ramyun calls for the water to be drained completely, save for “two spoons”-worth. It pushes the actual spices—a paprika, dried red pepper spice mixed with dried octopus powder—up top while preventing the heat from being diluted. If only this ramen committed to the heat. An underlying, but constant, sweetness cuts the heat short, progressively reeling in what could have been a heavy hitter the farther along in the meal you get. The next time you catch a cold, grab a bag of Paldo Teumsae Ramyun. What starts off as a reasonably spicy ramen gradually turns into a layered one-upping, where each spoonful you swallow incrementally ratchets up the temperature up one degree at a time. While the overall spice flavor tastes like a watered-down cayenne pepper, it begins to seep into (and immediately sting) your lips and the roof of your mouth. It pairs well with the springy noodles and offers a bearable kick for heat lovers of any level. It also meant I had to grab a tissue to blow my nose. From here on out, things get legitimately hot. Samyang’s instructions call for all of the water to be drained except for “eight spoons”-worth. The oily spice paste looks like bloody squid ink when poured out of the packet. The noodles inflate with a sticky sheen, a way for them to absorb the already concentrated broth as well as the accompanying packet of shredded seaweed and toasted sesame seeds. When combined in one bite, it tastes like a chicken soaked in a jalapeno broth with a subtle sweetness to it. Best of all, the heat doesn’t linger on the tongue or throat for longer than 15 seconds, which leaves you wanting more. All in all, it’s a delicious combination of flavors, and one that’s worth returning to for taste alone. If it’s not obvious by now, Samyang dominates the heat game. By definition, a mala sauce combines Sichuan peppercorn, chili pepper, and other spices to create an oil-based sauce that could numb the mouth. While Samyang’s take on the mala flavor didn’t quite anesthetize my mouth, it did raise the stakes from the company’s original Buldak Bokkeummyun (see above). At first, it looks the same: drained water, squid ink-colored sauce, sticky noodles that maintain their curl. But then you bite into it. The heat pools in the bottom of your mouth and doesn’t go away after swallowing or breathing. The emphasis falls on the spice instead of the chicken flavor, like you’re eating a wing that was baked in a chili rub. It’s a spicy instant ramen that actually brings the heat, and it still tastes good while doing so. There’s something threatening about pouring sauce packets that look like toxic black lava onto your ramen. Paldo’s Volcano Curry Kkokkomyun follows the spice trend of menacing introductions, both when the sauce swallows its seaweed strips and sesame seeds whole, and when the smell radiates with heat before you even open your mouth. Right from the first few bites, this ramen’s chicken flavor gets buried under the heat. Imagine eating a serrano pepper in one bite, and then immediately biting into another one afterwards. Hats off to the sauce for sticking to the noodles so that the spice is inescapable. That would probably explain why this was the one that finally made me break into a sweat, true to its volcanic moniker. Samyang found its audience, catered to it, and then realized it could do so much more—twice as much, to be exact. After the popularity of its spicy flavors skyrocketed, Samyang decided to get serious about the heat by doubling the intensity of their Buldak Bokkeummyeon, upping the Scoville units from 4,404 to 8,808. Like Samyang’s original Buldak Bokkeummyun, this one tastes like a chicken soaked in jalapeno and chili seeds, but the chicken flavor quickly falls out of focus once you focus on the heat itself. That said, unlike most intentionally over-spicy dishes, this one still tastes good as you go — you’ll just need to take some extra breaths or gulps of water in between bites (or how about kefir?). The oil in the sauce allows the heat to coat your mouth and stay put. I went about my day after eating this one and was still trying to wash it out with seltzer water more than 10 minutes later. For heat lovers, this one is fun to eat because it delivers on its spice, while still staying far away from real contenders like a Carolina reaper or Trinidad scorpion. For everybody else, it’s quite the food challenge, one so popular that this ramen is now available at Walmart. Nina Corcoran is the music editor of Boston's alt-weekly. For transparency's sake, please note that hate mail is printed and repurposed to fill cavities she acquired from binge-eating sour patch kids.